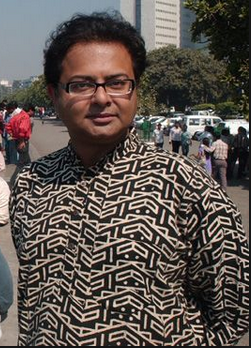 Rituparno Ghosh (born 31 August 1963, Death 30 May 2013) was a Bengali film director. He was born in Calcutta, West Bengal, India, his father Sunil Ghosh was a documentary film maker and his mother was also associated with Bengali Films. Ghosh was like an Icon for LGBT Community in India. He spent his later years of life as open homosexual person and chose a transgender lifestyle. He has won 12 National Film Awards in India and several awards at international film festivals. Before coming into films, he was directing in advertising, he was very popular for his one liner ad campaigns, one of the most popular Bengali ad campaign he had written was "Sharad Samman" for Borolene. In 1992, he debuted with a children's feature titled "Hirer Angti" (The Diamond Ring). His second movie Unishe April (19 April) won the 1995 National Film Award. Ghosh has directed Dahan, Utsab, Chokher Bali, Asukh, Bariwali, Raincoat in 2004 (in Hindi), Antar Mahal (2005), Last Lear (2007), khela (2008) for khela he won the national award for best film in Bengali, Abohoman (2009) for Abohoman he had won the national award for best director for bengali films. His upcoming film is Satyanweshi, he had finished the production for this film, before his death. Raincoat was an adaptation of the short story "The gift of the Magi" (1906) by O. Henry. Ghosh's last relased movie was Chitrangada (2012). This film is based on the work of Rabindranath Tagore "Chitrangada". This film won special jury award at 60th national film award. Ghosh also acted in some films, his first film as an actor was "Katha Deithilli Ma Ku" was directed by Himanshu Parija and released in 2003, it was an Odia film. He also acted in Bengali films Arekti Premer Golpo and Memories in march in 2011. Arekti Premer Golpo was based on homosexual relationship.